Sorry, you can only order up to 234 units of this product! The Affine Toulon range is an exquisite collection of designer suites, inspired by everyday living and the desire to have a dream bathroom. The Affine Toulon toilet boasts contemporary angular features to provide a designer feel to all bathroom suites. Be the envy of your family and friends with this stunning back to wall toilet. The contemporary back to wall pan boasts angular features with the added indulgence of an optional flush plate, hiding the cistern fittings; adding functionality to the bathroom suite. 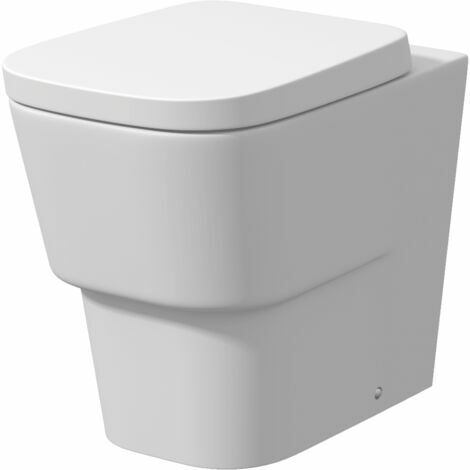 The back to wall pan also features a luxury soft close toilet seat which is a practical and comfortable solution. The slow and silent closing prevents damage to the ceramic of the pan and reduces wear and tear on the toilet seat itself. The quick release chrome hinges provide an easy clean solution and will perfectly match the beautiful chrome finish of your taps and shower.